The intriguing Bird's Nest Coral doesn't house birds... it can have crabs! The Bird's Nest Coral Seriatopora hystrix is not only very attractive, but in nature it also becomes the permanent residence of small crabs. Several species of crabs can modify the shape of the species in the Seriatopora genus and some other types of corals. A gall-forming crab called Hapalocarcinus marsupialis is one factor in the growth formation of the Seriatopora genus. The female crab will influence the growth of the thin branches to form a cage that permanently encloses her. The male crab, who is much smaller, can enter into the cage and mate with her. Thus the female spends her entire life in a self-imposed "jail", producing broods of larvae within her protective coral cage. The Seriatopora genus has many species, yet the most popular are the Bird's Nest Coral S. hystrix and the Bush Coral S. caliendrum. They are both found under the common name Bird's Nest, but it is actually quite easy to tell them apart. S. hystrix has thinner branches that taper to a point, and are usually pink, blue or cream. S. caliendrum have thicker branches and they don't taper but are blunt, and are usually cream, brown or green in color. The Seriatopora genus grow in a branch formation from a slender base. They intertwine into a twisted nest, with the branches fusing together as they touch in certain areas. The branches, depending on the wave action where they come from, can be thin or stout, and can be widely space or compact. The S. hystrix is often found in protected areas, and has delicate branches that taper into a point. Both the Bird's Nest Coral S. hystrix and the Bush Coral S. caliendrum are moderate to care for. They have similar requirements; needing high light, moderate turbid water flow, and stable water parameters. They are very sensitive to acclimation and adaptation, but once stabilized, they grow quickly and can be propagated quite easily. The Bird's Nest Coral, Seriatopora hystrix are similar to Acropora and Montipora, however some needs differ from coral to coral. For example, a Yellow Bird's Nest does well in dim lighting and will decline in health if put under bright light right away. A slow acclimation to brighter light is the only way to adjust them and prevent death. Also, buy a frag and allow it to grow with the water flow pattern in your tank. Otherwise, moving a mother colony or larger animal from it's normal strong water flow to a different one can cause it to die in spots that are used to the strong flow. Seriatopora Coral Information: The Seriatopora genus was described by Dana in 1846. There are 16 species and subspecies. Some common names these corals are know for are Bird's Nest Coral, Finger Coral, Needle Coral, Bush Coral, and Brush Coral. They have been successfully propagated in captivity. The Bird's Nest Coral Seriatopora hystrix was also described by Dana in 1846. Some of the common names they are known for are Needle Coral, Brush coral, Thorns of Christ Coral, Birdsnest coral, Brush coral, and Thin Birdsnest Coral. In a recent 2010 study of the genetic structure of the Bird's Nest Coral Seriatopora hystrix (found abundantly across a single reef), Pim Bongaerts and colleagues found that this coral actually consists of various genetically unique strains. The study entitled "Genetic Divergence across Habitats in the Widespread Coral Seriatopora hystrix and Its Associated Symbiodinium", found that there is a strong genetic partitioning with each strain isolated in three different habitats. Each strain is associated with a particular depth, and is not found at other depths. This indicates that corals may be much more adapted to a particular niche than previously thought. Where Seriatopora Corals Are Found: The Seriatopora genus are found in the Red Sea, and all along the east coast of Africa, then extending northeast to Madagascar, the Mauritius Islands, Cocos Island Ridge and then southeast to the Houtman Abrolhos Islands on Australia's west coast. The habitat extends around the northern coast and all the way to the Lord Howe Islands off the east coast of Australia. At Lord Howe Islands, it extends north east to Samoa, then northwest to the Phoenix Islands, Marshall Island and all the way to the Ogasawara-gunto Island, which are just east of the Ryukyu Islands. Continuing westward, they are found in Indonesia, and then from Andaman Islands, Maldives and Laccadive Islands, finishing westward back to the Red Sea. Seriatopora Coral Habitat:The Seriatopora genus are found in depths from 0 to 131 feet (0 - 40 m) in shallow reefs and upper reef slopes. S. hystrix inhabit shallow reef environments throughout the full range of the genus at depths of 20 to 115 feet (6 - 25 m). The colors of the Seriatopora genus can be orange, pink, brown, green and combinations and shades of these colors as well. The tips are generally lighter. The bright pink and pale colored specimens come from shallow water and need bright light. 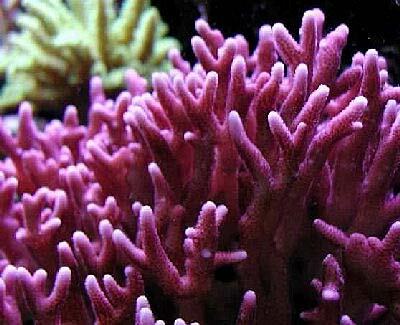 Bird's Nest Coral S. hystrix is usually brown with green or pink highlights, solid pink, purple, or yellow in color. The corals collected at greater depths where wave action is subdued are generally more delicate with thinner stalks. The branches are widely spaced or compact, depending on water flow. They have thinner branches that have needle like tips, and can to be quite dangerous to the unwary diver. Bushy Coral S. caliendrum have thicker branches which don't taper but are blunt. They are usually cream, brown or green in color. Seriatopora Coral Care: The S. hystrix is moderate to care for, yet this depends on the aquarists devotion to their coral. They are very sensitive to acclimation and adaptation to new water qualities, more so than others in this family. This leads to stress and disease, so acclimate them with care and patience. The Bird's Nest Corals do well in aquariums and will grow rapidly once established. Water flow needs to be turbulent and moderate. Newly acquired thin branched specimens should not be exposed to a heavy water flow, or they will fail to adapt. Thicker branched specimens can tolerate stronger turbulent water flow. Linear flow is tolerated, but not suggested for long term health of the coral. Once acclimated, they are actually quite easy to care for if their water parameters are kept stable. Seriatopora Coral Feeding: In the wild, Seriatopora corals have developed several feeding strategies. Through a symbiotic relationship with a marine algae, known as zooxanthellae, they receive the majority of their nutrients. They also capture planktonic organisms, food particles from the water column, and can absorb dissolved organic matter. In captivity, they do well in well-feed reef tanks. Like other SPS, they use their zooxanthellae for nutrition, but can be fed fine particulate foods like Marine Snow etc. once a week. Pristine tank conditions are typically needed to keep all SPS corals. Keep the nitrate levels low, and maintaining calcium and alkalinity levels. Typically you can do water changes of 20% a month, 10% biweekly or 5% weekly. It has been noted that 5% weekly water changes replenish many of the needed additives. With higher concentrations of coral with calcareous skeletons, there may be a need put in additional additives to maintain proper levels for good growth. A well-feed live rock/reef environment is what is needed for your Bird's Nest Coral, along with some fish for organic matter production. A mature tank is recommended. Usually prefers bright light, but if it is collected at lower depths it may be sensitive. Place the coral in medium intensity light when first purchased and slowly increase the intensity over time. Make sure that no other corals can come in contact with your Seriatopora. Seriatopora spp. are mild mannered, but can be aggressive if touching other corals. Seriatopora are mild mannered corals, but can be aggressive if touching other corals.. Because of this, they must be placed away from other corals. The Seriatopora genus gets along with their own species and at times has small commensal crabs that inhabit their branches. Colonies are male or female. It is possible that size is a factor as far as identifying them. The small polyp stony (SPS) corals are male and female and can reproduce both sexually and asexually. In the wild they reproduce sexually by releasing eggs and sperm at the same time, resulting in a fertilized egg which then forms into a free-swimming planula larva. Eventually the planula larvae settles onto the substrate, becoming plankters. This then forms a tiny polyp which begins to excrete calcium carbonate and develops into a coral. Planula larvae are extremely vulnerable to predation, and very few survive. Seriatoporas reproduce asexually as well. In the wild Seriatoporas spread from breakage due to storms and fragmentation. The Seriatopora genus has an additional peculiar method of asexual reproduction that was actually discovered in the aquarium, it is called 'polyp bailout'. This is where polyps will detach themselves from a dying colony, and these skeletonless polyps will then form new colonies by normal budding. Propagation is very easy for Seriatopora corals. When sexually mature, they reproduce in aquaria, and can actually produce a much larger number of specimens that can be harvested. They are sexually mature in 2 to 3 years. Asexual fragmentation is the typical way to propagate, similar to Acropora. First you need to choose a healthy coral that is not showing any signs of distress. Then, simply cut a branch at least 2" long and glue the frag to a plug or rock. You can use the 2-part epoxy or underwater putties. A little tip, don't glue frags upright since they will grow faster on their sides.The slime that the coral will exude should not come in contact with any other corals and gloves are suggested. Give the frag ample water flow. The Seriatopora spp. are generally disease resistant, but do not tolerate poor water conditions very well. They can get the same illnesses that any other small polyp stony (SPS) coral can get under poor conditions. In general, if your S. hystrix has any kind of tissue recession, just cut off the healthy part. Just make sure you cut into some of the healthy part also, to be sure there is no disease encroaching on the healthy tissue. Also, keep out the cyanobacteria and algae with good water movement, and your Bird's Nest Coral will stay happy. Seriatopora Corals for Sale: The Bird's Nest Coral S. hystrix is very easy to find at pet shops and on line. Online they can run about $49.00 to $90.000 USD or more depending on size and/or color. The Seriatopora genus has been propagated in captivity with great ease and it is always suggested to get your coral from captive bred stock.